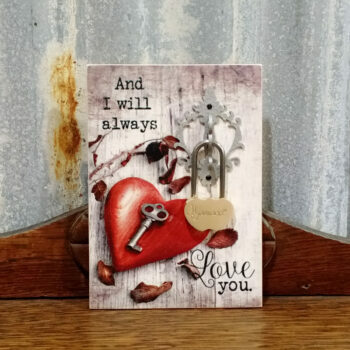 The Always Love You Plaque is a great way to personalize special occasions like Valentine’s Day, anniversaries, memorials and makes a perfect gift. More and more people today are choosing to do more than what is considered traditional. Families and friends are looking for unique ways to customize their moments of choice. This beautiful wooden sign is wonderfully distressed with various shades of gray, white and reds. The words (And I will always Love you) are beautifully written in black script.